Dale A. Drinnon has been a researcher in the field of Cryptozoology for the past 30+ years and has corresponded with Bernard Heuvelmans and Ivan T. Sanderson. He has a degree in Anthropology from Indiana University and is a freelance artist and writer. Motto: "I would rather be right and entirely alone than wrong in the company with all the rest of the world"--Ambroise Pare', "the father of modern surgery", in his refutation of fake unicorn horns. A plesiosaur (pronounced /ˈpliːsiəsɔər/; Greek: plēsios/πλησιος 'near' or 'close to' and sauros/σαυρος 'lizard') was a type of carnivorous aquatic reptile (mostly marine but also sometimes freshwater). After their discovery, plesiosaurs were somewhat fancifully said to have resembled "a snake threaded through the shell of a turtle", although they had no shell. The common name "plesiosaur" is applied both to the "true" plesiosaurs (Superfamily Plesiosauroidea), which include both long-necked (elasmosaurs) and short-necked (polycotylid) forms, and to the larger taxonomic rank of Plesiosauria, which includes the pliosaurs. The pliosaurs were the short-necked, large-headed plesiosaurians that were the apex predators for much of the Mesozoic. Plesiosaurs (sensu Plesiosauroidea) appeared at the start of the Jurassic Period and thrived until the K-T extinction, at the end of the Cretaceous Period. While they were Mesozoic reptiles derived from a common Diapsid stock that lived at the same time as dinosaurs, they were neither dinosaurs nor Archosaurs. Plesiosaurs had a broad body and a short tail. They retained their ancestral two pairs of limbs, which evolved into large flippers. Plesiosaurs evolved from earlier, similar forms such as pistosaurs or very early, longer-necked pliosaurs. There are a number of families of plesiosaurs, which retain the same general appearance and are distinguished by various specific details. These include the Plesiosauridae, unspecialized types which are limited to the Early Jurassic period; Cryptoclididae, (e.g. Cryptoclidus), with a medium-long neck and somewhat stocky build; Elasmosauridae, with very long, inflexible necks and tiny heads; and the Cimoliasauridae, a poorly known group of Cretaceous [and post-Cretaceous?]forms. According to traditional classifications, all plesiosaurs have a small head and long neck but, in recent classifications, one short-necked and large-headed Cretaceous group, the Polycotylidae, are included under the Plesiosauroidea, rather than under the traditional Pliosauroidea. Size of different plesiosaurs varied significantly, with an estimated length of Trinacromerum being three meters and Mauisaurus growing to twenty meters. The Polycotylidae was separately chosen as the most likely source for the modern sightings of the smaller "Marine saurians" of the Ambon SS type,which in turn seem to be related to the creature known from a carcass in West Africa known as "Gambo". And so it seems, as Tyler Stone suggests, the Plesiosaurs which survived into modern times are both related, but one type is from a long-necked (Dolichodeire) family with a medium-loong neck, generally similar to Cryptoclidus, but a surviving related line is a secondarily shorter-necked Plesiosaur type related to the Polycotylids. And it seems that the medium-length-necked surviving type also carried foreward adaptations making it able to tolerate both coldwater and freshwaters better than the more specialized Elasmosaurs. Since the remains of possible post-Cretaceous Plesiosaurs seem to indicate an as-yet-not-properly named genus (or closely related genera) related to the well known Cryptoclidus at about 25-35 feet long, I have done some comparisons between some depictions of the Loch Ness Monster and reconstructions of that genus. The first one of these was done at the beginning of the Frontiers-of-Zoology group and compared Arthur Grant's land sighting to the Cryptoclidus represented in Walking With Dinosaurs. This was a paste-up I called 'CryptoClyde' and was meant to demonstrate that Grant's sighting corresponded in proportions and dimensions to the reconstructed plesiosaur. I have cannibalised that comparison into the larger version below. I added the insert with the 'Surgeon's Photo' from Loch Ness on the strength of Paul LeBlond's analysis of the photo from CRYPTOZOOLOGY, in which he estimated the size of the thing being depicted as about four f eet high, six feet long when stretched out. In another article in CRYPTOZOOLOGY, LeBlond had compared the 'Surgeons Photo' to the Mansi photo from Lake Champlain and found them to be similar enough to most likely be the same sort of creature. The neck in the 'Surgeon's Photo' is also just about the same size as Grant had reported. I add another comparison with the Rhines AAS underwater head and neck photo, of similar proportions but estimated as twice the size, and then another comparison with the Rhines head and neck to another reconstruction of Cryptoclidus. Frankly, I do not like the way the head and neck in the 'Surgeon's photo' are aligned if it is actually a plesiosaur, but then perhaps current theory on the flexibility of Plesiosaur necks does not cover living Plesiosaurs, n'est-pas? I also did a very exhaustive comparison of the head and neck in the photo to various kinds of waterbirds native to the area and none of them match at all well. It is the opinion of both Mackal and Coleman that the photo is authentic but represents a bird in the water. Such a bird must therefore be an unknown animal in itself. There have been attacks made on both the 'Surgeon's Photo' and on Rhine's underwater photo at Loch Ness, most infamously with the assertion that Christian Spurling confessed to hoaxing the 'Surgeon's Photo' on his deathbed. Christian Spurling's account 'frames' the Daily Mail for hoaxing the photo to boost readership and is a libelous statement. Christian Spurling did not make a deathbed declaration and the account shows that he had no real knowledge of the photos in question - specifically the fact that there was more than one photo, with the object in different configurations, and not possibly the same object photographed twice. There have also been statements made that a toy submarine made of materials at hand in the 1930s with a monster's-head superstructure would be top-heavy and tip over rather than stay afloat. A rather more peculiar problem is that there seems to have been no model he could have copied to look like the 'Sea Monster' in the photo: I have not seen any previous Plesiosaur reconstructions that actually match it. After the image of the photo was established in the imagination of the public, it seemed obvious to say that "I made a model of how the Loch Ness Monster looked" but it was not possible to say that before hand! As to the Rhines AAAS underwater photo from the mid-1970s, it has been criticised by saying the head is not obviously continuous to the neck and that it needs to be aligned in the vertical plane. The critics that say this then go on to re-orientate the photo in the horizontal plane, inverted of its usual orientation. They then say it is a photograph of the bottom. It does not match the other photos more obviously showing the bottom, but the real problem is that saying this destroys their own argument. If the photo is indeed meant to be horizontal, then there is no reason why you need to say it must be vertical, and if it represents the bottom, then the tow parts really are continuous and the apparent break is only a trick of the shadows. Which is what supporters had been saying all along. I am not saying that the 'Surgon's Photograph' is necessarily NOT a hoax; what I am saying is that it is consistent and that part could not have been known before hand. And in the matter of analysis I defer to LeBlond. Additional note: Many sources attribute a date of April 1 to the Wilson photo. The date was meant to be April 19, and what had happened was that one popular source had printed the '19' at the end of one line of text and the last digit '9' had fallen off the end of the line of type. This happened in Gould's book The Loch Ness Monster and Others, and I own a copy. Joseph Leidy had written several articles about the earliest finds of Plesiosaurs in North America, and one of them was the disputed 'Discosaurus' in Alabama, possibly originating from the same beds as 'Zueglodons' (Basilosaurus). He was writing in the 1850s and one of the comparable early finds was from the Greensands of New Jersey, thought to have been of Late Cretaceous age. The specimens in this case were named 'Cimoliasaurus'; however, some of them turned out to be cetacean vertebrae of probably Pliocene age, probably some sort of a dolphin. In this case the really interesting thing is that the New Jersey fragmentary Plesiosaur is found in association with Pliocene dolphin fossils, mixed up together and only separated out later, and the Alabama fossils Leidy considered probably the same genus are labelled as coming from the Eocene zueglodon beds. In the case of the New Jersey Greensands, there is independant evidence that they are not only Cretaceous but also Tertiary: another site gives a paper in which several genera of O. C. Marsh's 'Cretaceous' birds from the New Jersey Greensands are actually of Eocene date or later. The characteristics of these fossils has placed them tenatively in the same family as Cryptoclidus and Muraenosaurus, and they were thought to have been like the Elasmosaurs but with shorter necks. This is also along the lines of what the surviving Plesiosaurs would have to have been to give rise to our Long-necked Sea-serpents: long-necked, but not excessively long-necked, not so specialised as the extreme Elasmosaurs, and generalised enough to be versatile, possibly enough so that they could pursue other avenues of evolution that became open to them. That makes a good deal of sense and I am willing to arrange the theory of Plesiosaurian survival on those terms alone. There is more on Discosaurus pssibly being from Eocene deposits in th 1981 book "Fossil Vertebrates of Alabama"
I did not see Scott's comment at the time but he is absolutely right and that book was in fact one of my sources. Cryptoclidus ( /krɪptɵˈklaɪdəs/ krip-toh-KLY-dəs) was a genus of plesiosaur (a type of marine reptile) from the Middle Jurassic period of England. Cryptoclidus with a human to scale. 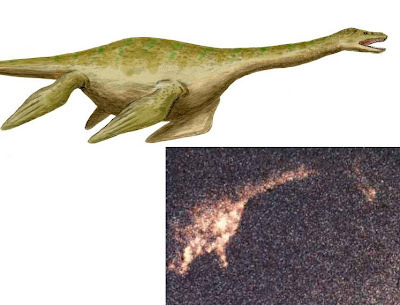 It had a neck that was up to 2 metres (6.6 ft) long that does not seem to have been very flexible. This probably kept its bulky body away from its small head so as not to alarm potential prey. It had four broad paddle-shaped limbs, with which it either "flew" through the water in wave-like undulating movements, or swam like a porpoise by moving upwards on two flippers and gliding back down again on the other two. Due to their seal-like body plan, small plesiosaurs such as Cryptoclidus have been depicted as amphibious animals instead of fully marine reptiles. Despite looking clumsy and cumbersome, in water it would have been relatively graceful, using all four limbs as paddles, to swim and hunt its prey. It may have laid eggs in sand, but this is only conjectural. The fragile build of the head and teeth preclude any grappling with prey, and suggest a diet of small, soft-bodied animals such as squid and shoaling fish. Cryptoclidus may have used its long, intermeshing teeth to strain small prey from the water, or perhaps sift through sediment for buried animals. The size and shape of the nares and nasal openings have led Brown and Cruickshank (1994) to argue that they were used to sample seawater for smells and chemical traces. Cryptoclidus is a plesiosaur whose specimens include adult and juvenile skeletons, and remains which have been found in various degrees of preservation in England, Northern France, Russia, and South America. Its name, meaning "hidden clavicles", refer to its small, practically invisible clavicles buried in its front limb girdle. The type species was initially described as Plesiosaurus eurymerus by Phillips (1871). The species name "wide femur" refers to the forelimb, which was mistaken for a hindlimb at the time. ^ Palmer, D., ed. (1999). The Marshall Illustrated Encyclopedia of Dinosaurs and Prehistoric Animals. London: Marshall Editions. p. 75. ISBN 1-84028-152-9. The close-up details of Cryptoclidus anatomy are a good match for the reports of the Loch Ness Monster and its kin, especially the specific shape of the head with the placement of the eyes, the shape and the placement of the flippers, and the slope of the back as seen from the rear, which can easily be imagined to give the appearance of an upturned rowboat. The shorter necked Plesiosaur is reported at sea less often but it is smaller and not so striking in appearance. On the other hand, it is reported as being captured in nets fairly regularly and to account for several otherwise puzzling carcass cases, such as the characteristic "Gambo" carcass found in The Gambia, Western Africa. I give Tyler Stone credit for this identification. Today will mark the first time I have featured a guest blogger. I could not have asked for a better one. Alton Higgins is the Chairman of the Texas Bigfoot Research Conservancy, a college professor of Biology, wildlife biologist, and a noted birder. He is also my good friend. A recent article at Salem-News.com related startling claims from explorers searching for pterosaurs in Papua New Guinea. Young Earth Creationists have long espoused the theory that pterosaurs live in that region, and expeditions have been repeatedly mounted to document their existence with the notion that such a discovery would serve to discredit evolutionary theory. Unfortunately, the video clearly shows a frigatebird, a large pelagic fish eating bird that obtains most of its food while flying, not a pterosaur. Five species of frigatebird are found throughout the world’s tropical oceans. Frigatebirds typically breed on remote oceanic islands and are consummate aerialists, capable of spending weeks in continuous flight and often ranging far from land. While this blatantly obvious conclusion regarding the identity of the bird does not, in itself, preclude the possibility that some “frightened natives” have seen living pterosaurs, it does present doubts regarding the reported sightings of Blume and Woetzel. The purpose of this article, however, is to put a Texas twist on the issue of misidentifications, not to delve into the existence of pterosaurs in the South Pacific. Unusually large mysterious flying creatures have long been reported from the Lone Star State. Just as is the case in Papua New Guinea, these seemingly inexplicable sightings are sometimes ascribed to pterosaur-like creatures. Others are sometimes called Thunderbirds, an evidently generic term applied to what appear to be huge birds that are otherwise rarely seen. A high percentage of these sightings originate in the southern part of Texas along the Mexican border. Author Ken Gerhard chronicles these kinds of sightings in his 2007 book “Big Bird! Modern Sightings of Flying Monsters.” Is it possible that some of these flying monsters are misidentified frigatebirds? Frigatebirds are stiking creatures. In fact, the frigatebird species most likely to be observed in or near Texas is named the Magnificent Frigatebird (Fregata magnificens). They have huge wingspans at seven and a half feet, comparable to those of Bald Eagles. By comparison, a frigatebird would seem to dwarf the familiar Red-tailed Hawk and its four-foot wingspread. The frigatebird’s size and unusual appearance would instantly attract attention, especially if it were to be seen in desert or prairie environments, far from its normal haunts in the farthest reaches of the open sea. As unlikely as this may appear at first glance, frigatebirds DO sometimes wander inland. Mlodinow (1998) summarizes the occasional meanderings of frigatebirds into the American interior. He states that Magnificent Frigatebirds have been reported as far inland as Colorado, more than 700 miles from the nearest saltwater. There are eight frigatebird records for Oklahoma and four from Kansas, one a mere sixty miles from Nebraska. New Mexico has six records. All in all, the typical Texan would not be expected to see a frigatebird in his or her lifetime and would be even less likely to know what they were seeing. The fact that these impressive birds, with their singular appearance, range rarely and unexpectedly into unfamiliar domains could account for some of the reports from baffled witnesses who mistakenly relate their sightings to extinct and mysterious creatures. "In the upcoming second edition of the nonfiction book Live Pterosaurs in America, a whole chapter is devoted to the Marfa Lights of southwest Texas"
The Marfa lights, also known as the Marfa ghost lights, have been observed near U.S. Route 67 on Mitchell Flat east of Marfa, Texas, in the United States. They have gained some fame as onlookers have ascribed them to paranormal phenomena such as ghosts, UFOs, or Will-o'-the-wisp, etc. However, research suggests that most, if not all, are atmospheric reflections of automobile headlights and campfires. And "The creature flew away before the boy’s mother entered the yard, and she discounted the encounter as a combination of a bird and a child’s imagination." The vivid colouration is reminiscent of a baltimore oriole. A baltimore oriole in flight has a wingspan of about a foot. That could appear much bigger to a child. And while baltimore orioles regularly pass through Texas they are not fulltime residents there: therefore one could be present and not recognised for what it was fairly easily. It’s all too easy to pick upon cheap plastic toys and complain about how bad they are, so I will. However, despite the withering criticism and scorn I am about to pour onto this awful excuse for a ‘pterosaur’ there is a more pertinent point to be made, so either enjoy the bile and then stoke one’s chin thoughtfully over the social commentary / science / dinosaurs bit, or just skip to that now if you can’t be bothered too wade through the ‘look at the bloody carpus, it’s rubbish!’ rubbish. The tail vane should not be present, and even if you want to argue for a rhamphorhynchoid tail, the vane is the wrong shape. In other words, this is really, really bad. I’m honestly not sure I’ve ever seen worse and I have looked. It pretty much fits every ‘top 10’ of bad pterosaurs which in itself is quite and achievement. However, the important thing here that I want to note is not how bad it is, but the fact that it came in a big pack of dinosaurs most of which were actually pretty good. OK, so the colours were lurid and most were a bit too upright in stance so they balanced on their tails, but really the proportions and details were about right (raptorial claw, long arms and stiff tail for the dromaeosaur, huge skull and just two fingers for the tyrannosaur, non-dragging tail for the sauropod and so on). Why then such a disaster when we reach the pterosaur? I have touched on this before, but I think it is ultimately an artefact of public perception. Thanks largely due to Jurassic Park, but also any number of associated projects (other dinosaur films, new books, documentaries etc.) that spawned from its popularity, dinosaurs have had a new lease of life. The public (like it or not) have been exposed to lots and lots and lots of ‘modern’ upright, feathered, active dinosaurs. As such, if only subconsciously, they have a new perception of dinosaurs. However, the pterosaurs seem not to have enjoyed the same shift in perception. 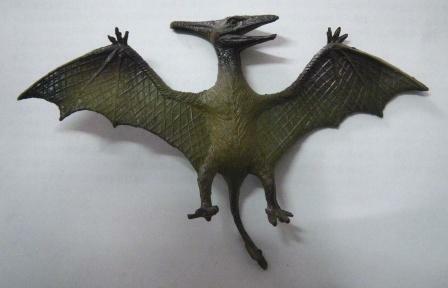 They still lumber about with bat wings and scaly bodies, perched on tree branches or gliding through the air. I’m not foolish enough to think that pterosaurs will ever get the attention that dinosaurs do (and I’m happy to admit that at some level they don’t deserve that attention – the average dinosaur is more interesting and / or important than the average pterosaur) but this in itself is odd. To many people, pterosaurs *are* synonymous with dinosaurs so you would think that they might get dragged into the 21st century of public perceptions if only by accident. Even if not, many people accept and recognise that our understanding of dinosaurs has and continues to change rapidly, yet bizarrely they seem not to realise that this *also* happens to all the other prehistoric beasties. It is I think an odd situation. The public seem to have accepted a ‘new’ vision of dinosaurs with all that entails while steadfastly refusing to budge on anything else, including pterosaurs which many consider to be dinosaurs. It’s a rather odd state of affairs and leaves us with this terrible pterosaur in an otherwise satisfactory collection of cheap dinosaur toys. I’m forced to conclude that, sadly, it may simply be that the average member of the pubic pays so little attention, and gives so little thought, to anything not explicitly put in front of them (be it in the cinema or a textbook) that they miss the point that lots of research on all things is going on all the time. This (I guess) filters down to the point that anyone not actively interested in pterosaurs or palaeontology as a whole might not be aware of this, to the point that even someone designing model dinosaurs knows about dromaeosaur claws, but not pterosaur wings. The really basic problem to the Creationist's model for Surviving Pterosaurs is that the reports combine characteristics found in two completely separate types of pterosaurs as illustrated below by Matt Billie, and you cannot combine the long tails of the Rhamphorhynchids with the large size of the tailless Pterodactyloids. Any more my favoured explanation for "Pterosaur" sightings in The Mediterranean, the Caribbean and the Pacific Rim is that they are surviving Pelagornithids, which were parallel to Pteranodon and could grow every bit as large: their spiked jaws looked much like sharp pointy teeth and they lived on fish. There are a couple of sightings in Texas that I would put in this category, and another couple of possible sightings in South America: and a residual of "Ropen" reports might refer to them. I have read the chapter on alleged marine saurians in Michael A. Woodley's book In the Wake of Bernard Heuvelmans and Woodley proposes in this chapter that marine "saurians" could be archaeocetes that still survive because archaeocetes were (sort of) reptilian or crocidilian looking and they swam with the same wriggling/struggling motion observed in marine saurian sightings. Is there any particular reason you are asking me Jay Cooney's questions for him? The answer is, not especially and there are easily enough Marine Saurian candidates without going that route. Heuvelmans only admitted to Marine Saurians undulating laterally. Heuvelmans made it clear he thought of the creatures in such reports as reptiles and not mammals, except only in the case of the Ambon creature (?=Gambo) which he thought could be a primitive sort of a whale. basilosaurids could undulate horizontilly as well as vertically; just because vertical undulation has not been observed in marine saurians does not mean that is not present in the animal. Your statement is drivel. Just because they have not been demonstrated to be card-carrying members of the communist party does not mean they are not card carrying members of the communist party. How can you honestly make any such assertion not based on the slightest scrap of observation to back it up? To top it off your comment is completely irrelevant to the blog posting you have added it at the end of. Try doing THAT again and Ishall delee your posting without hesitation. This blog does NOT allow anonymous comments. All comments are moderated to filter out abusive and vulgar language and any posts indulging in abusive and insulting language shall be deleted without any further discussion. In order to be fair and have more choices, there are now two Popular Posts lists: the first one is for the last 30 days and the second one is for all-time favorites. Some posts may appear on both lists temporarily. In Accordance with Title 17 USC Section 107, any copyright material on display here is under Fair Use without any claim of ownership or any profit accrued by the display. The Material herein is for non-profit educational or criticism puposes only. Notwithstanding the provisions of Sections 106 and 106a, the fair use of a copyrighted work including reproduction and distribution of said material as specified in that section, for purposes of education, news reporting, commentary or criticism, scholarship or research, to persons who have expressed a prior interest in receiving such material for such purposes, is NOT an infringement. This one is one of mine.